Bollywood star Salman Khan sentenced to prison for five years after a court found Salman guilty of poaching rare antelope two decades back in the western state of Rajasthan while shooting a film in 1998. 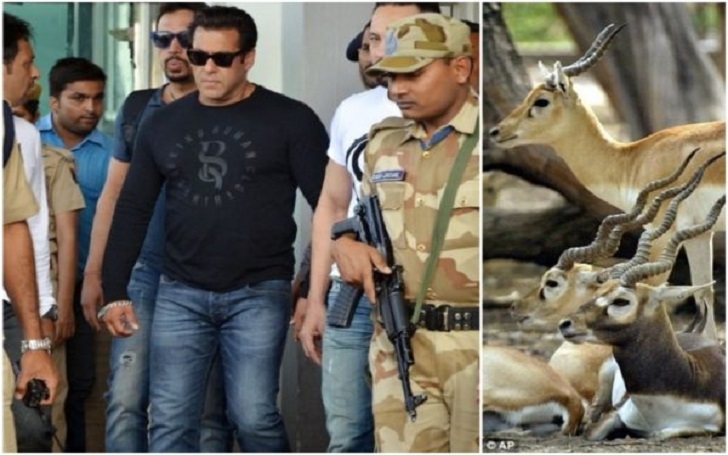 A court in Rajasthan state said Salman Khan, who starred alongside Bollywood-Hollywood actress Priyanka Chopra on 2004's movie Mujhse Shaadi Karogi, had been convicted of illegally hunting the two blackbucks with his car while filming in Jodhpur in 1998. The eyewitnesses alleged that 52-year-old Salman and four other actors in the car with him fled the scene when they were caught leaving the animals’ carcasses behind. The other actors, among them Sonali Bendre and Saif Ali Khan were acquitted by the court in Jodhpur on Thursday for lack of evidence. This is not the for time Salman has convicted. In December 2015, one of the world's highest paid actor was cleared in a 2002 hit-and-run case in which he killed a homeless man. The original poaching case against Salman was filed by the local Bishnoi community.